Paul Hessert died in the summer of 2001 as a result of injuries from a terrible car accident. His wonderful wife was also seriously hurt, so the memorial service for Paul was not held until September, just a few weeks after 9/11. Traveling was difficult for many of his former students; only a few of us made it to the United Methodist church in Montrose, PA. It was one of the honors of my life to be asked by his family to speak to the congregation as a representative of his many, many students over the years. His daughter sent the wonderful photo of Paul. Thank you! To Paul Hessert, an extraordinary teacher. I wrote part of my words for today during the week the terrorists attacked the World Trade Center and Pentagon. What a hard and rocky time this has been. As some of you know, I write a weekly column for the newspaper in my hometown, the Journal Times of Racine, Wisconsin. This has not been an easy time to be a columnist, or much of anything else. But I did the best I could. I turned out a column that tried to offer folks the opportunity to reclaim the great meaning and grace in our everyday lives and relationships. I know I was preaching Christ crucified, though most of my readers wouldn't recognize that phrase if it came to them engraved on a Fig Newton. The Friday morning my column ran, I received several unexpected phone calls and e-mails from people who said that what I wrote moved them. It was no deluge of fan-mail, but it was an unexpected amount of response and it moved me, too. Why I'm mentioning this here? One caller was a friend of mine. Mary Ann and I have been in the same Sunday school class for several years. Sometimes we walk together. She knows how strongly I felt this summer when I learned of the passing of Paul. Several times she listened to me try to explain what he meant to my life. "I never knew your teacher, the one you say was so important and who taught you how to think about things. But maybe when you talk at his memorial service, you should tell those people that whatever he taught you has been a great gift to us in Racine. You are teaching us how to be wiser and more accepting of all the stuff life can dish out. You make us grow, bit by bit. So if that's because of your teacher, then his family ought to know how far his wisdom has reached. There's a whole town here learning what he taught you." When I was calling some people to tell them that Paul had died, they would tell me other folks I should call. Soon I was talking to David Meyer, a man I wouldn't know from Adam. I gather he's worked in the book publishing business all his life. 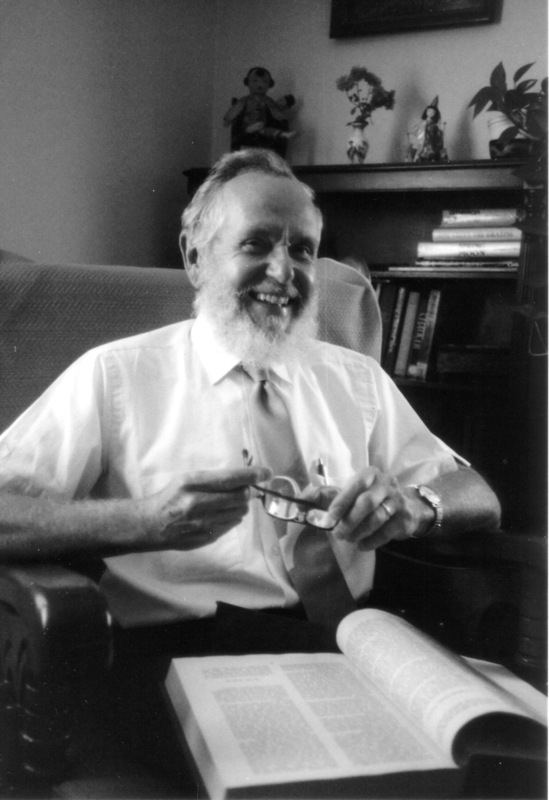 Meyer had been a doctoral student of Paul's in the early 1960's. As soon as I said why I was calling, there was an immediate catch in his voice. "I haven't sat in a class with Paul in 40 years and yet there isn't a week that goes by that I don't think of him, that I don't use the education and the wisdom he taught me." What an amazing teacher Paul was. What a topsy-turvy Ponzi scheme it was to be his student. He passed his wealth to us; we took it with us into our lives and passed it on to so many others. Let me share something Paul said to me once that, I think, explains what he attempted to get through our heads. I'm not very good at keeping outlines and organized intellectual thoughts in my head. I'm not exactly a ditz, but don't ask me to recount to you why Tertullian was important either. In my life a Niagara of really cool knowledge has rushed into my brain and whooshed over the side. I went to visit Paul in his office one afternoon after I had gotten another C in another class. Maybe it was the semester I took History of Ethical Thought at Seabury. Lord, never were a class and a girl less suited for each other than that encounter. Gives me the willies just to remember it. Those blessed Episcopalians would get all revved up, then start down the highway of learning with multi-syllabic theological terms, with phrases heavier than an 18 wheeler with no brakes. Often I'd have to stop by Paul's office afterward just to see if I was still in one piece, more or less. Once I mentioned to him, with great sincerity, that I'd consider trading my soul for a brain that could retain proper and orderly intellectual thoughts. That if there were four aspects to something, I could remember even three of them, instead of being able to tell you what color the room was when I heard them and how the sun slanted in the window. It was a pretty true and pretty funny thing to say. And Paul, who laughed at me a lot, didn't laugh that day. He scared me. He furrowed his eyebrows at me. "What you have Mary Beth is a precious gift. Don't ever trade it away or make light of it. Use it." I don't know if all students got that from him. But I think a lot of us did. He was an intellectual giant. We knew that. You don't get a Ph.D. from Edinburgh from a mail order catalog. He skated back and forth through the world's knowledge like a kid on roller blades. He was so intelligent; he was a master of learning and scholarship. But that wasn't what he was trying his hardest to hammer into our heads and hearts. The body of knowledge he was teaching us was important - but for a reason. Not to impress people at cocktail parties - as if the ministry crowd was going to be real big on the cocktail circuit anyway. Not to arch up our eyebrows and play intellectual chicken with each other. Not to intimidate lesser beings in our churches and lives. If we even dare to think there might be lesser beings, we hadn't learned anything anyway. Yes, we took notes until our eyes crossed. We studied, we read, we wrote paper after paper after paper. But the point was to know what to do with our knowledge when we got it. We needed to learn how to live with generosity. To not be afraid. To know what to offer people when their hearts were breaking. And what not to dump on them. To know when the truth around us is really truth or just optimism dressed up in sheep's clothing. Sure he taught us content. But unlike so many teachers, he taught us something even more important. He insisted we learn the point of knowledge. If we could not use it to serve God and each other more steadfastly, than all our books and papers weren't worth a damp stack of last year's phone books. How well this man taught us. How deeply he challenged us. We will never be able to measure the influence he had in our world because they don't make instruments to detect what's eternal and everlasting. But I suspect that if Paul's genuine influence could be measured, it would be the mustard seed that moved mountains. We often sang this hymn in those precious Outline of Theology classes. I never get through it without seeing the sunshine poring through the windows of the classroom. Without crying for what grace it was to be Paul Hessert's student. “Blest be the dear uniting love that will not let us part. Mary Beth, What a joy to open your new website and see Dad's name at the top of the list of articles. You write beautifully, insightfully. Thank you so much for sharing your writing - it's quite a gift. I'll get a photo emailed to you. Oh Judy, it is so wonderful to hear from you! I would love a photo. Kathleen who was in that class also sent me a photo, but we both laughed because it was from the end of the year beach party! Not our typical selves. Your dad gave me language with which to live my life. I miss him so often. He sounds like a wonderful person. You also truly have a great way of putting this all into remarkable words. I've told you often enough, I can't even begin to fathom. Love this new format. Easy to read. I also like the suggestions you make at the beginning , giving suggestions on what to read. Hello Mary Beth. I have been greatly impacted by his book Christ and the end of meaning . I was wondering if you knew how to get a copy of his book, no other gods . It’s currently out of print . I just looked at Amazon - Wowsers! they are selling it for $50-153? I can hear him laughing from here! I have his book but it's inscribed to me, not willing to sell. My husband and I just searched a bit more, the book exists in PDF form on line. Search for "Christ and the End of Meaning." Then you can print it out. Does this help? Did you attend GETS? My email is MB@MaryBethDanielson.com I'm interested to hear more about your story. Hessert was the most impactful person in my life - and I have lived a life influenced by many spectacular people. I do have a copy of the book Christ in the end of meaning . Its in PDF form. I got it from Peter Rollins, who has been greatly influenced by his book . I thought the book “no other gods” was a different one . Is it the same book under a different title ? That’s the one I’m looking for right now . Or any of his other writings of any kind. I can email you for a more discussion if that works better,as I would love to here your take on many of the concepts he covers within his writings. Yeah, write to me. I don't have 'No Other Gods'. I do have class notes - two years worth, some quotes from class (I need to find them but I can).